These days, most of us have a smartphone or an iPad. It’s simply become common place. 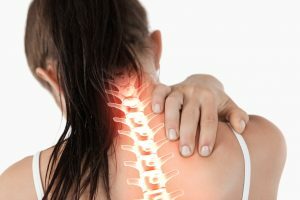 What I’ve realized over the past few years as an Overland Park Chiropractor is that the neck pain, headaches, and back pain related to using these devices have also become commonplace. 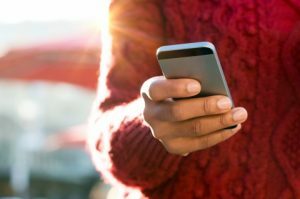 Dr. Fishman who coined the phrase “text-neck” describes this condition as “an overuse syndrome where you have your head hung forward and down, looking at your device for extended periods of time.” Yup, that about sums it up! Most of my chiropractic patients don’t make the connection between looking down at their devices all day and their neck pain because of the small muscles we use during the motion. That’s a huge mistake to make because the impact of improperly using those muscles daily has lasting effects on our bodies and usually results in chronic neck pain, headaches, and back pain. We do this motion all day and every day, which labels it as a repetitive action. This repetition puts our spine in the wrong posture many times throughout the day; therefore, neck pain is bound to be the result. Our head alone weighs approximately 8 to ten pounds. For our neck to be able to support such weight, it must be in the correct neutral posture which is having your ears over your shoulders for most of your waking hours. Texting brings our head forward and out of correct neutral alignment, each and every time we text; which for some of us is quite a bit! Most of my chiropractic patients with “text-neck” suffer from neck pain and chronic headaches, but over time it can also begin to change the overall curvature of our spine especially as our kids being using these devices younger and younger. What can we do to prevent Text-Neck? – Strengthen your neck muscles & your upper back muscles. – Bring the device up to a move neutral level. – Make sure to stretch those muscles you are using. – Stop using your devices as much! – And of course maintaining proper spinal alignment is critical in preventing this problem! Chiropractors are experts at helping your body maintain proper alignment or fixing it if it’s causing you pain. If you already have a chiropractor make sure to have this conversation her on your next visit. If you don’t have an Overland Park Chiropractor give me a call: 913-681-7757!